Libraries have taken on a new role as dynamic, cultural and social hubs for their respective communities. 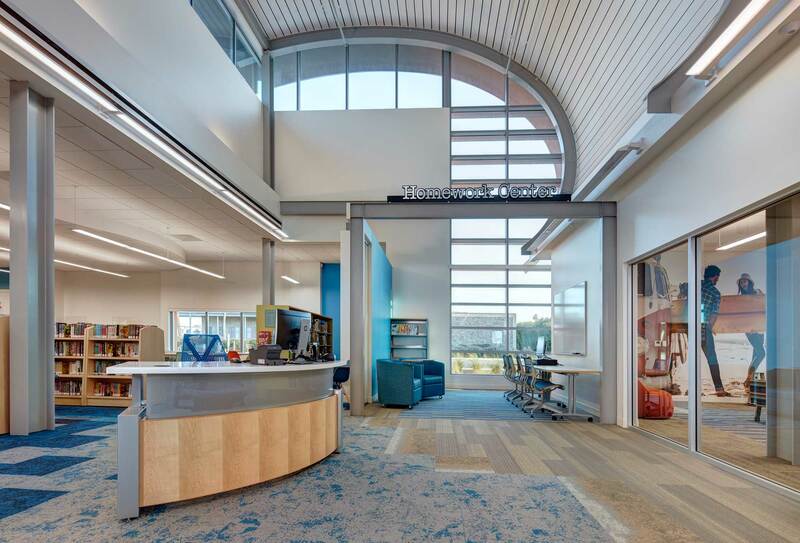 Where books were once the focus, libraries have repositioned themselves as multifunctional destinations—a central space to connect with others and with state-of-the-art multimedia and technology. The Imperial Beach Library is no exception. 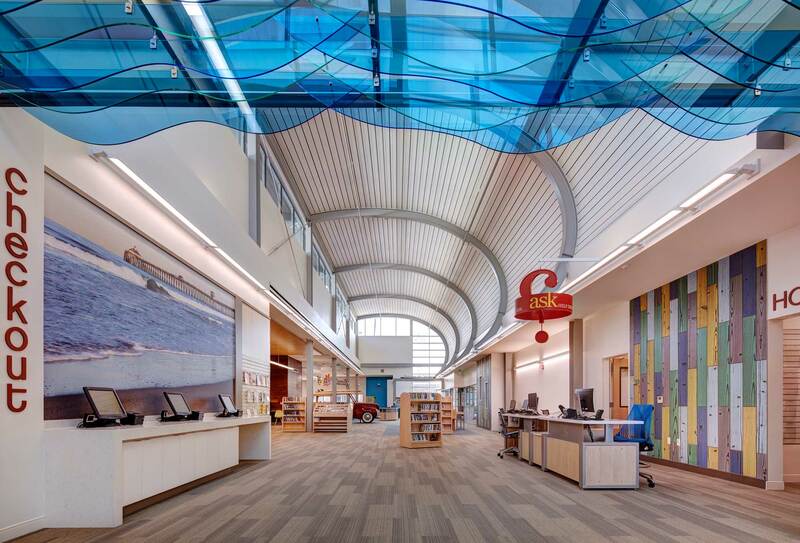 Delawie designed the interior of the new, 14,830 square-foot Imperial Beach Library that serves a diverse population of 27,000 residents living in the small beach-oriented community often referred to as the “Most Southwesterly City in the U.S” due to its proximity to Tijuana, Mexico. It stands adjacent to the Imperial Beach Senior Center, Mar Vista Community Center, and Veteran’s Park. 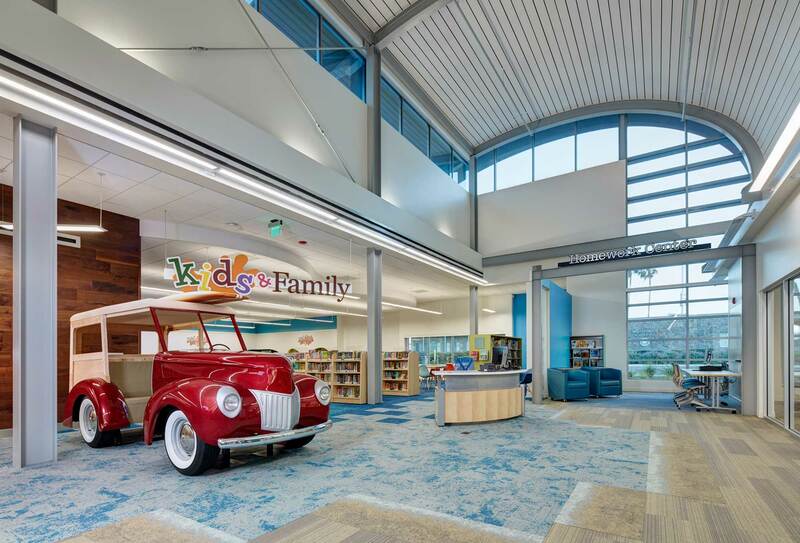 The new facility replaced the nearly 50-year-old, 5,100 square-foot county-owned building that the library operated out of since 1966. 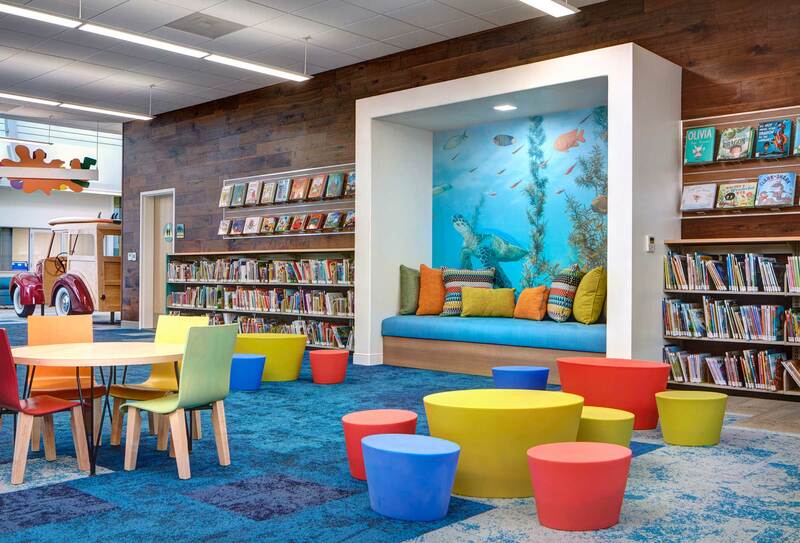 The library’s interior incorporates natural motifs into the scheme and custom wayfinding devices that allow patrons to naturally flow through the series of spaces defined through the use of colorful wood-like tiles and integral colored stucco. A custom carpet design simulates a bird’s eye view of the native beachscape as it transitions from brown hues of sand, white hues of wave break, and deep blue hues of the depths beyond. Custom seating throughout offers a blend of residential comfort with commercial durability and true functionality—rolling armchairs are equipped with built-in charging stations and materiality that matches the specific study space. A predominant interior design feature, a replica Woody station wagon placed in the Children’s Area, pays homage to the local surf community, where residents truly appreciate Mother Ocean and get out there to enjoy it. 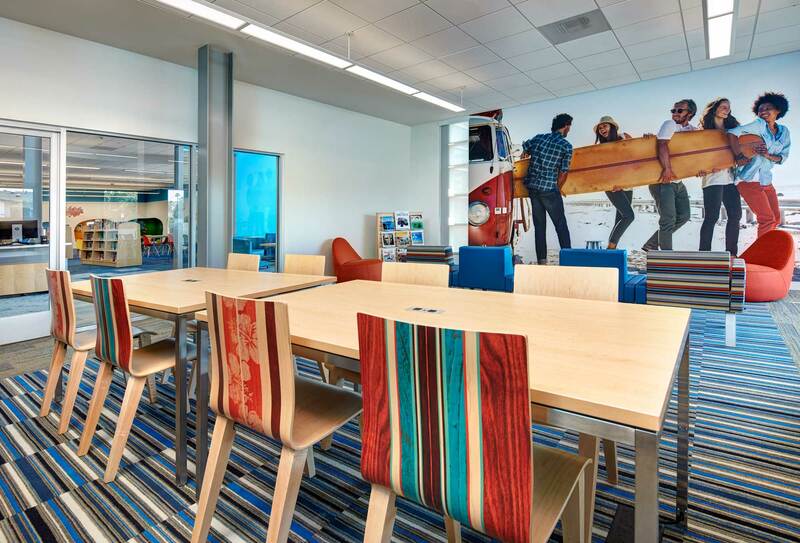 There are also custom surfboard-shaped computer stations and a large color print of the iconic Imperial Beach Pier. 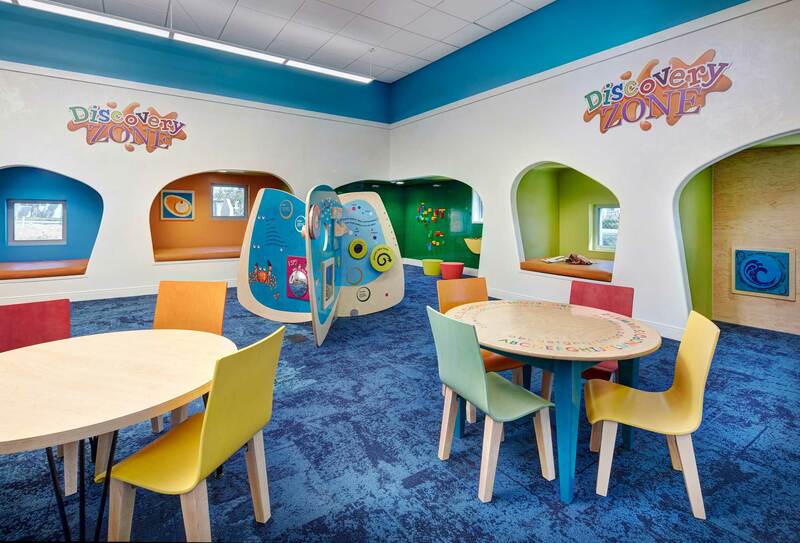 Natural light is paramount, filtering through the main circulation space and into the fun and inquisitive Children’s Area with built-in reading nooks and interactive, social play areas. 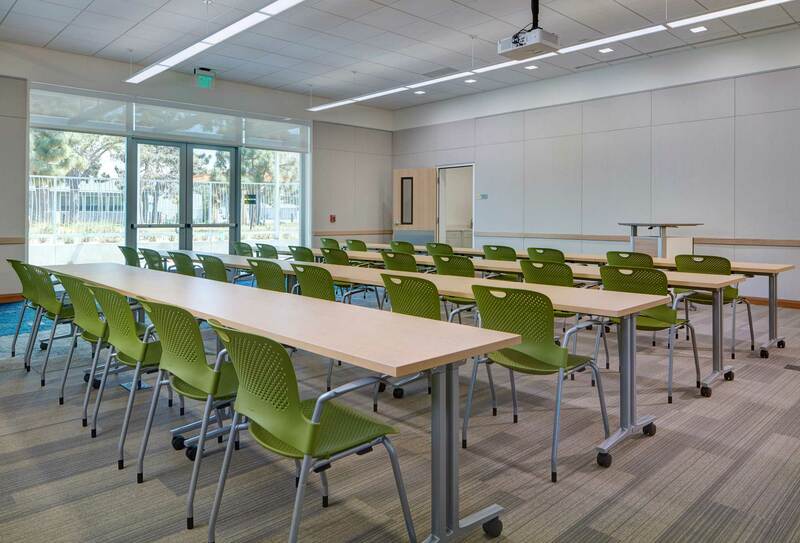 The expanded facility also features a greatly enhanced materials collection, a Teen Room with dedicated study areas for controlled and introspective study, a large community room for events and meetings, wireless internet, a computer lab, and automated book check-in and check-out. 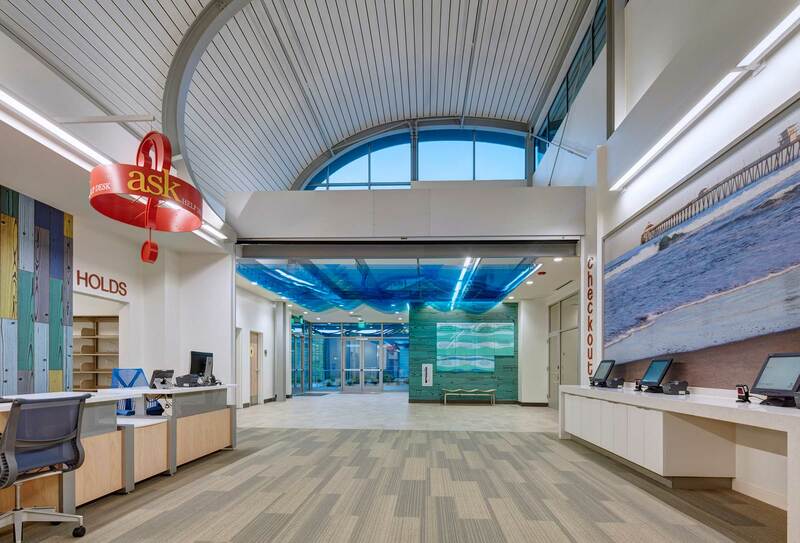 The building is a touchstone of sustainable design practices, certified by the USGBC at the LEED Gold Level and designed as a Zero Net Energy building. The array of rooftop solar panels, an 88kW photovoltaic system, assists in generating renewable energy equal to the building’s power consumption. The Delawie-designed interiors were developed in association with Jeff Katz Architects, domus architecture and TB Penick. Program: Library, community rooms, event space, computer lab, children’s area, private study rooms, bookstore, outdoor patio, automated book check-in and check-out stations.